In the spring of 1965, three former University of Kansas students purchased a six-acre plot of land in southern Colorado for $450. “Our long-term vision was that Drop City would function as a ‘seed’ for future communities that would sprout around the world,’’ said Clark Richert, one of Drop City’s chief architects, now a professor at Rocky Mountain College of Art and Design in Lakewood. Drop City was among the most well-known rural communes in the country, although all signs of human life had vanished from the property in less than a decade. Forty-four years later, its impact as both an artistic and social experiment is the subject of a documentary in progress. “Drop City is the best example of the potential and perils of trying to build an alternative culture in America that I’ve ever come across,’’ said documentarian Tom McCourt, associate professor of media at Fordham University. In their search for former “droppers,’’ McCourt and filmmaker Joan Grossman have embarked on a road trip across California, Montana, Colorado, and New Mexico. Drop City cofounders Richert and Gene Bernofsky pioneered “Drop Art’’ in the early 1960s, dropping objects from the roof of a loft in Lawrence, Kan., onto the street below as a means of conceptual artwork. 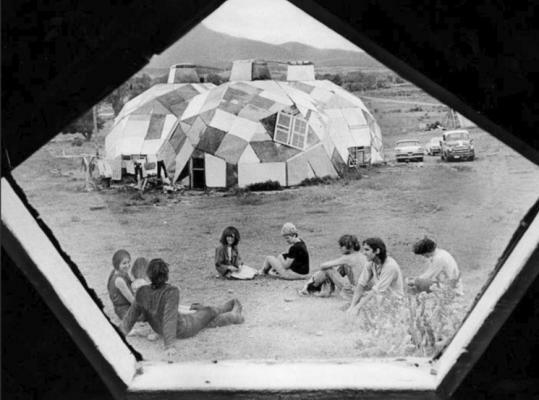 The idea for a “city’’ grew as a manifestation of this new expression, and Drop City was established as one of the country’s first communes. After graduating from the University of Kansas in 1965, Bernofsky and his wife, JoAnn, set out for Colorado to fetch Richert, who had graduated two years earlier and was working toward a master’s degree in fine arts at the University of Colorado at Boulder. “We followed tips from townspeople and ranchers as to where we might find land to purchase - tips which eventually [led us to the town of] Trinidad,’’ Richert said in an e-mail interview. Designed as a sustainable colony for artists and filmmakers, Drop City began as a single quasi-geodesic dome constructed entirely from lumber scraps and old car parts. “We had already decided to start the community before I attended lectures by Buckminster Fuller at the University of Colorado . . . [but] after sitting in on a couple of his six-hour visionary orations, I became convinced that we should ‘take the leap’ and build geodesic domes,’’ recalled Richert. He, the Bernofskys, and fourth founder Richard Kallweit had no prior knowledge of geodesic geometry. Their first dome, held together by bottle caps, tar paper, and chicken wire, was built with no formal blueprints. As settlers poured in, more domed domiciles were constructed, and the communal kitchen-dome nearly tripled in size. Douthit, who adopted the name Peter Rabbit while in the commune, was one of the “core 12’’ who lived on the property before national media exposure and an influx of visitors led the original four to move out in 1968. Richert returned to Boulder to complete his master’s degree and created the artists’ cooperative “Criss-Cross’’ with fellow founding members. Ironically, the community’s downfall was not necessarily the result of its location on the desolate Colorado plains, but to overexposure and a loss of consensus. Within two years, the population had grown to more than 20 residents and temporary visitors, some of whom saw Drop City as merely a novelty. After the last of the “core 12’’ moved away, the settlement remained inhabited for several years, though the original ideologies of the founders had all but disappeared. Still, Richert sees echoes of the experiment today.